"Great time here - varied marshy environment - excellent guide KB and viewing. Enjoyed their hide during the day. Accommodation is fine - basic tents and quiet close together - but shows how much the people and the game drives make a camp as we enjoyed Sango the most of the four excellent camps we stayed. Elephants noisily eating leaves from the trees outside the tent at night and the hippos and hyennas calling at night were the opposite of soporific - but a great experience. " "As stated previously could not be better"
"Another camp with a wonderful welcome. We even had singing and dancing before dinner which preceded an interesting introduction to our menu for dinner ! Freshly baked gf, bread and cakes, wraps and pancakes were available for my son. All alcoholic and soft drinks were freely available ! Tea and coffee available too any time. My adaptors didn't fit the plugs but we were able to buy an adaptor, probably left behind by someone, and it was a great help. There was a choice of sockets too, so helpful ! " "This was super luxury for me. I didn't really know what to expect but I was blown away with the standard here. From the singing on arrival, to the standard of lodge, personal guides, quality of food, dinner in the bush to the range of animals I saw - it was incredible. " "Wonderful camp - loved the set up and all the extras, like hot water bottles and ponchos! Food and drink was very good and there was always more than enough to go round. Tented rooms were above our expectations! Staff all very friendly and helpful"
"At night the hippos offer a lullaby. By day the camp offers all you need for a great stay. It was good to see a camp run by local people who are determined to give their guests a thoroughly enjoyable stay. We even experienced a surprise bush evening meal in a bush camp lit by candles. So much work had gone into creating a magical scene , a feast cooked on the campfire and with plentiful booze to accompany the three course meal. Sango was friendly place where every face greeted you with a smile. " "Smallest of our 4 camps and again very friendly staff and comfortable tented accomodation. It was Frank our guide who found the leopard and wild dogs." "We loved the small, intimate camp and the wonderfully welcoming staff. 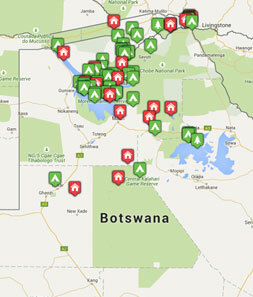 Game viewing was superb, especially being able to go off-road and stay out a bit after dark." "Food pretty average but the camp is amazing given its location. Guiding (Frank) was incredible, very insightful and the welcome is warm and friendly. Would recommend to anyone. " "Truly exceptional, has a unique charm, ticks all the boxes for a wonderful wildlife experience"
"Smaller camp (12 people) which was full the whole of our stay. Like Moremi Crossing, had a very pleasant atmosphere because of the small number of people and the interaction with the guides. " "A different experience across a much larger safari area enabled us to witness a more varied range of animals including our first sightings of wild dogs and a leopard. Watching a pack of wild dogs tease a crocodile, a stand off between a hippo and an elephant. Seeing a group of hyena pups playing outside the den and drinking sundowners 20 yards from a leopard resting in on a tree bough were our highlights here. " "Sango was not quite as luxurious as Pom Pom but nevertheless quite adequate. The food was the best here for me as there was always a vegetarian option. I think I missed the hot water in the morning because of the cold! The hot water bottle in bed was wonderful!!! " "lots of animals in camp which was exciting no AC so one afternoon it was really hot in tent in btwn drives. Need fans in there esp since there is no pool or other places to go. However, the rooms were adequate and nice. Meals: great cook. simple breakfast, good lunch, and dinners were the best meal. Best option for kids. " "This was great camp! It doesn't describe itself as luxurious but it is very comfortable and well equipped. The staff were very friendly and clearly enjoy their work. Most live in the local village. The solar panels provide gentle lighting after dark and the bucket showers work really well. Just ask and hot water appears minutes later! This was probably the favourite of the 3 camps that we stayed at. My complicated dietary requirements didn't phase them either!" "A fabulous bush experience, my absolute favourite. An even smaller camp with friendly people working there and a great atmospher among the guests.The bucket showers were novel for 3 nights but glad to get back to a proper one. Should have brought a torch as there are only solar and oil lamps. I loved sitting round the campfire and sharing stories with other travellers and guides."